Pseudo Echo formed in Melbourne in 1982 by school friends Brian Canham on vocals, guitars, and keyboards and Pierre Gigliotti (as Pierre Pierre) on bass on keyboards, they were joined by Tony Lugton (ex-James Freud & the Radio Stars) on guitars and keyboards.The group were named for a sound effect available on their keyboards and were influenced by New Romantics bands, Duran Duran, Spandau Ballet and Ultravox. Molly Meldrum, television presenter for pop music series Countdown, saw the group at a gig and aired them on the show with a demo version of “Listening” in June 1983.The band initially used a drum machine until replaced by Brad Gormley (drums) in July.They were signed to EMI Records and “Listening” – produced by Peter Dawkins – was issued in November as their debut single, which peaked at No. 4 on the Australian Kent Music Report Singles Chart. In 1987, the band re-released “Listening” for the movie North Shore starring Nia Peeples. The track was re-recorded with Mark Berry and Brian Canham producing. The US Promo 12″ featured new mixes by Mark Berry and the 7″ Edit and Instrumental remixed by William Wittman. 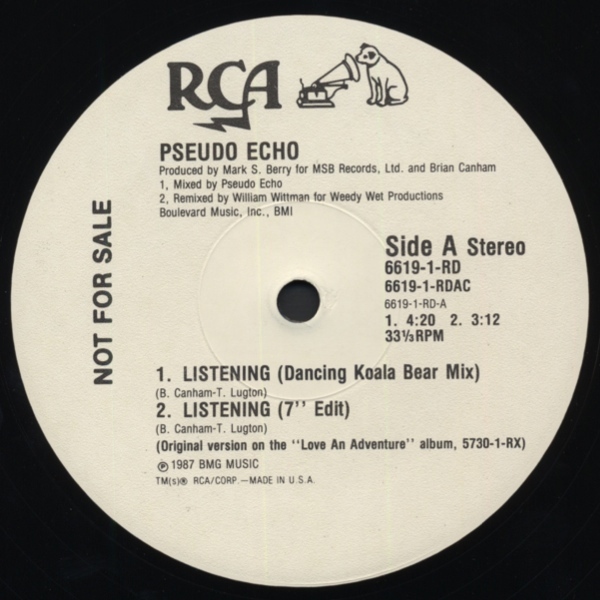 Unless I do manage to track down the US Mark S. Berry remixes of “Listening” (Dancing Koala & Dancing Berry Mixes), this post brings us to the end of the Pseudo Echo US remixes and re-recordings. “Funky Town” is a single which I personally did not care for but it did become the band’s biggest hit and hopefully brought to you today in mixes you have never heard before. In October 1986, Pseudo Echo released a rockier version of the Lipps, Inc. disco song “Funky Town”, which spent twelve weeks at number-one from December.The album, Love an Adventure, was re-released the following year to include their remake of “Funky Town” which brought the group their biggest international success, the single reached No. 6 on the Billboard Hot 100 in the United States, and No. 8 on the UK Singles Chart in July 1987. “Funky Town” was released on 12″ with a Dance Mix running 6:36 but in the US a number of house/dance mixes were commissioned which saw release on Promo only. 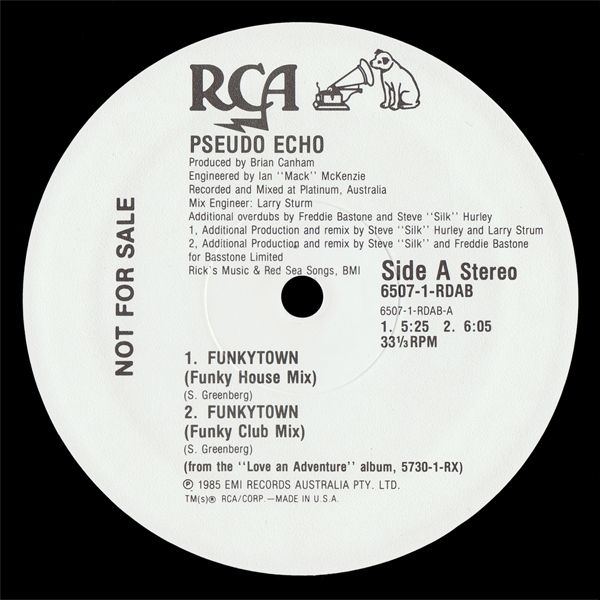 The “Funky House Mix” was credited to Larry Sturm & Steve “Silk” Hurley, the “Funky Club Mix” to Freddy Bastone & Steve “Silk” Hurley and on the flip side, the “Funky Vocal Mix” and “Funky Dub Mix” were both remixed by Freddy Bastone. 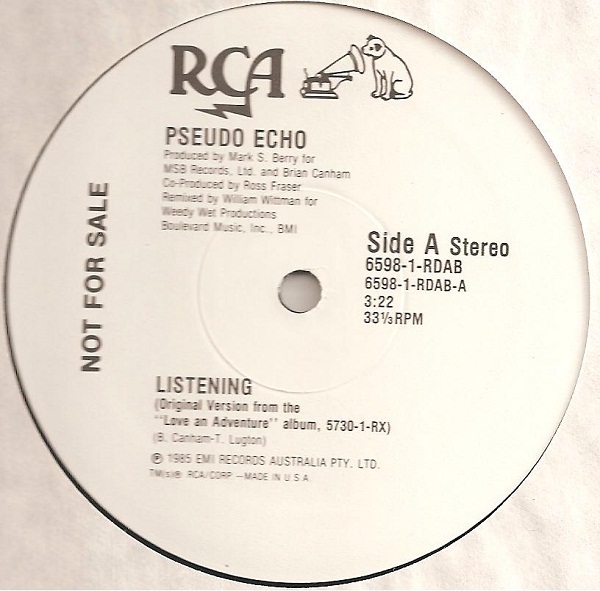 “Listening” was the debut single by Pseudo Echo, peaking at No.4 on the Australian charts in November 1983. The history of the track subsequent to it’s Australian release was long and when a record company eventually gets round to compiling the band’s releases including all of the US versions and remixes, this may be the track which will cause the most headaches. In 1985 this was followed up by todays post, a pair of AOR radio remixes by William Wittman. William had recently achieved success working with the Outfield, Hooters and Til Tuesday and was an excellent candidate for remixing Pseudo Echo for US radio. Although some listings state that both sides of the 12″ are identical, the mixes do differ slightly and are of different lengths. The track had also been re-recorded for this 12″ with production now by Mark S.Berry. The final outing for the track was in 1987, in the wake of hit single “Funky Town”, “Listening” would reappear on US 12″ in the form of the “Dancing Koala Bear Mix” while the US White Label Promo 12″ added the “Dancing Berry Mix” by Mark S. Berry. 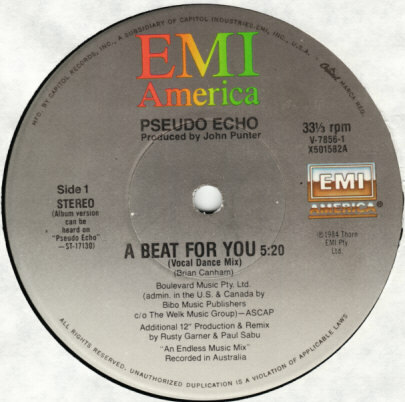 “A Beat For You” hit the Australian Charts in April 1984, reaching #12 but it’s Australian remix running 7:26 was only released in Australia and New Zealand. Obviously the US record company had faith that this was a hit single as it received not only the remix treatment by Mark S. Berry in 1985 (already posted) but this earlier release with remixes by Paul Sabu & Rusty Garner. The duo had previously worked together remixing Matthew Wilder’s “Break My Stride” and Kim Carnes’ “Hurricane” in 1983, and the classic “Go Insane” by Lindsay Buckingham in 1984. 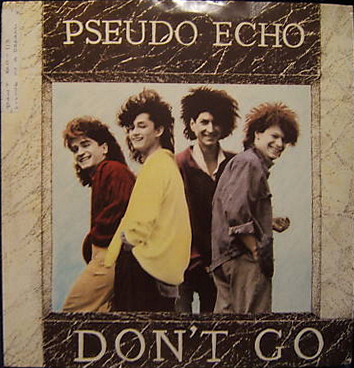 Although not an obvious choice as remixers for Pseudo Echo, the pair turned in a pair of excellent mixes which never saw release outside the US. 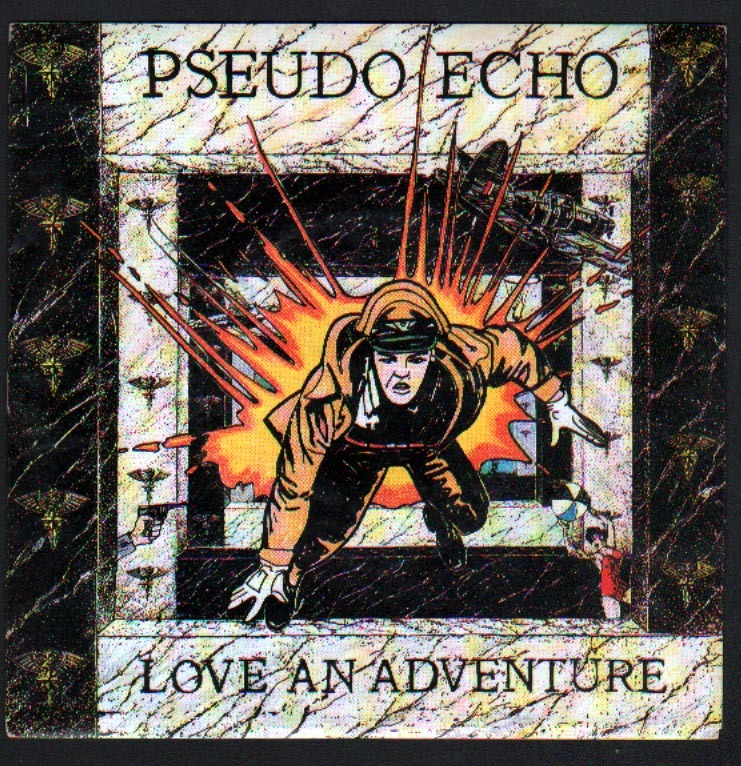 The second single from Pseudo Echo’s sophomore album was the title track “Love An Adventure”. Written by Brian Canham and produced by Mark S. Berry, the single would go to No.6 in the Australian charts in January 1986. Remixed by Ian “Mack” McKenzie, who was also the engineer on the track, and Pseudo Echo for the 12″ single release. Ian McKenzie also provided remixes for other major Australian 80’s artists such as Noiseworks and Models. “Don’t Go” was the most successful single from Pseudo Echo’s sophomore album titled “Love An Adventure” reaching No.4 in Australia in October 1985. The single would of course be outperformed by the cover of “Funky Town” which was subsequently added to the album 12 months later. Despite “Don’t Go” being one of the stand out tracks on the album, when the album was released overseas “Funky Town” would replace “Don’t Go” and re-mixed versions of three singles from the debut album would also be added. “Don’t Go” was produced by Mark S.Berry who also remixed the earlier single “Living In A Dream” for this 12″ release. 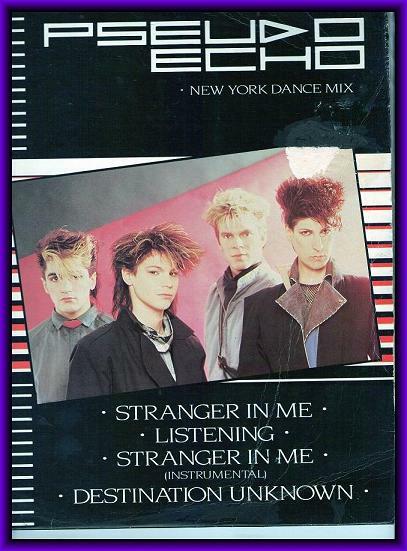 “New York Dance Mix” is an early collection of Pseudo Echo remixes by Steve Thompson, with collaborator Michael Barbiero on Engineer duties. The collection included two hits from the debut album “Autumnal Park”, “Listening” and “Stranger In Me” and also an Extended Version of album track “Destination Unknown”. The original tracks were recorded at EMI Studios 301 in Sydney while the remixes were performed at the Mediasound Studios in Manhattan, NY where Thompson & Barbiero would eventually mix the biggest rock album of the 80’s Guns ‘N Roses “Appetite For Destruction”. Molly Meldrum, television presenter for pop music series Countdown, saw Pseudo Echo at a gig and aired them on the show with a demo version of “Listening” in June 1983. They were signed to EMI Records and “Listening” – produced by Peter Dawkins – was issued in November as their debut single, which peaked at No. 4 on the Australian Kent Music Report Singles Chart. Their first album Autumnal Park, produced by Dawkins and John Punter, was released in June 1984, which peaked at No. 11 on the Kent Music Report Albums Chart. It was an Ultravox-influenced effort which, besides “Listening”, yielded the singles “A Beat for You” (No. 12 in April), “Stranger in Me” (July) and “Dancing Till Midnight” (December). For the US market, the track would receive the remix treatment by Mark S. Berry who would produce the band’s second album in the same year. Pseudo Echo formed in Melbourne in 1982 by school friends Brian Canham on vocals, guitars, and keyboards and Pierre Gigliotti (as Pierre Pierre) on bass on keyboards, they were joined by Tony Lugton (ex-James Freud & the Radio Stars) on guitars and keyboards. The group were named for a sound effect available on their keyboards and were influended by New Romantics bands, Duran Duran, Spandau Ballet and Ultravox. A later line-up included James Leigh (keyboards) and his brother, Vince Leigh (drums). In the 1980s, Pseudo Echo had Australian top 20 hits with “Listening”, “A Beat for You”, “Don’t Go”, “Love an Adventure”, “Living in a Dream” and their cover of “Funky Town”, which peaked at No. 1 in 1986. In 1987, it reached No. 1 in Canada and New Zealand, No. 6 in United States and No. 8 in United Kingdom. Their second album, Love an Adventure issued in November, was produced by Mark S. Berry, and Brian Canham, which reached No. 14. Three of its singles reached the Top 20 including “Don’t Go” (No. 4 in October), “Love an Adventure” (No. 6 in January 1986), and “Living in a Dream” (No. 15 in May). A fourth single, “Try” (August), did not peak into the Top 50. The US 12″ release of “Living In A Dream” included the original Oz Mix by Jim Taig and the Single Mix and Dance Mix by John Potoker.